In a "back to the future" move, Gap (GPS) has launched a new brand devoted to jeans that look like the ones it sold when it first opened in 1969. The flagging retailer likely hopes the retro styles will help bring old customers back to its stores, and maybe even attract new customers from popular retailers such as Abercrombie and Fitch (ANF). The headquarters of the new "1969" brand is in downtown LA, in the historical garment district. The executives who run the project work out of an old cigar factory. And the slogans for the new line are flashbacks to old denim-care instructions, such as: "Wash your jeans inside out to maintain their original color," and "Don't wash jeans, live in them." But not everything is déjà vu. The 1969 line of offerings includes dresses and shorts, which weren't available 42 years ago. 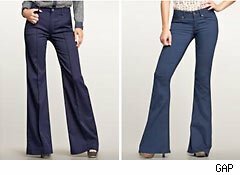 In another change from 1969, much of the marketing for the jeans will happen online. "Aligned with how people want to discover and share information, 1969: L.A. and Beyond will live primarily in the digital world via a series of video vignettes and sponsored editorial on Gap's Facebook page, http://www.facebook.com/gap, and on outlets such as DailyCandy, FabSugar, Glam, Hulu, LookBook, Pandora, Refinery29, RollingStone and TrendCentral," the company announced during its "1969" launch. Gap obviously wants to marry the new with the old. Aside from launching a prominent new "1969" section on its website, as well as a new marketing campaign to promote the brand, some Gap locations in New York and LA also will get "1969" logos on their store fronts. It's a lot of publicity for a new launch, even for a company with 3,100 Gap, Old Navy, and Banana Republic stores. Gap is ready to try anything to help slow sales. Over the last two years, the retailer's shares have dropped nearly 19% while the S&P 500 has grown 30%. Same-store sales have been weak over the same period. But it's hard to understand why 2011 customers would be interested in 1969-style jeans. Gap already has had enough trouble managing its three main brands. It seems unlikely that adding a fourth will help.